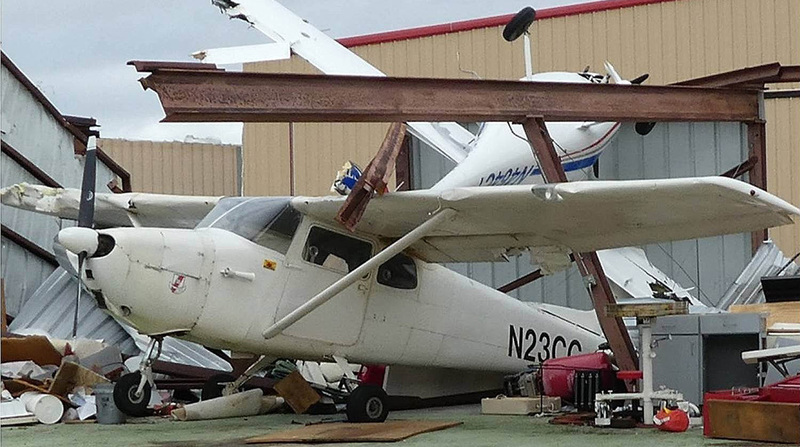 Planes are tossed around like toys after Hurricane Harvey wreaks havoc at McCampbell-Porter Airport in San Patricio County, Texas, in 2017. 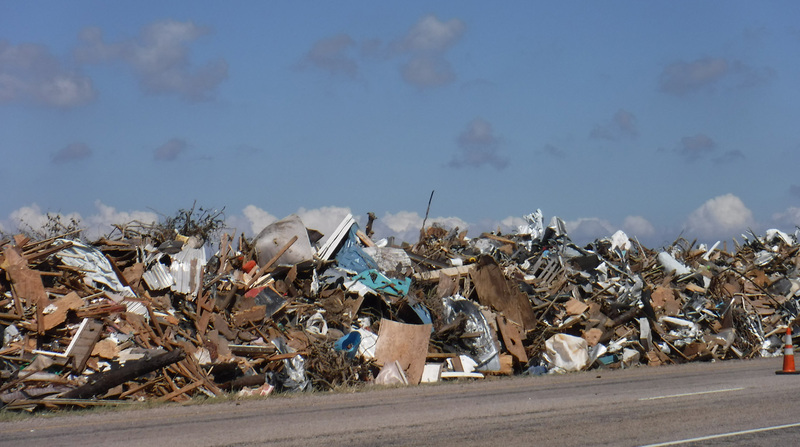 Huge mounds of trash fill the median along State Highway 35, which runs between Portland, Texas, and Aransas Pass, Texas -- testament to the massive damage Hurricane Harvey caused. 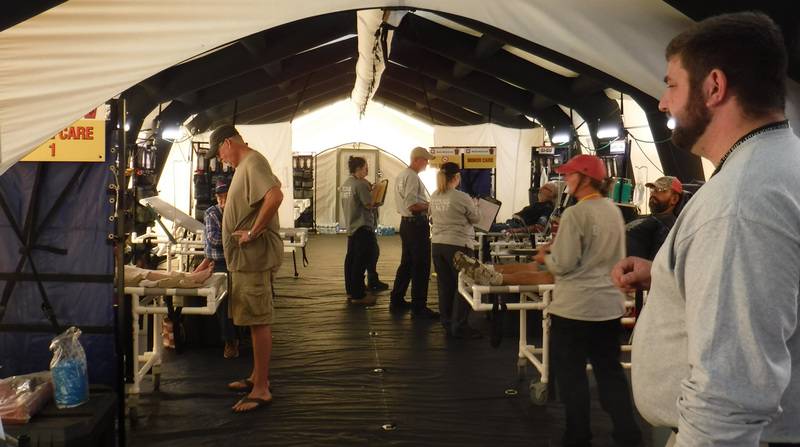 Texas Emergency Medical Task Force members set up tents at McCampbell-Porter Airport to treat patients with injuries and other health issues after Hurricane Harvey ravaged the area. Residents displaced by Hurricane Harvey line up to receive food and water in Rockport, Texas, after the storm left many homeless and without basic necessities. 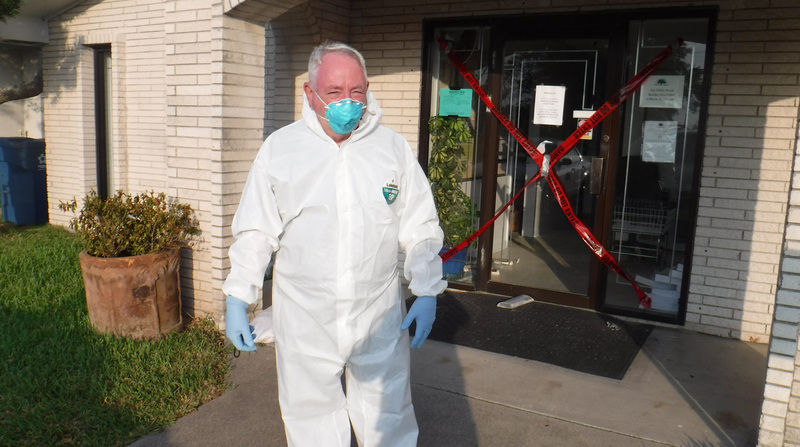 Family physician James (Jamey) Mobley, M.D., M.P.H., prepares to enter his practice in Aransas Pass. Riddled with mold after catastrophic flooding, his insurance company deemed the facility a total loss. 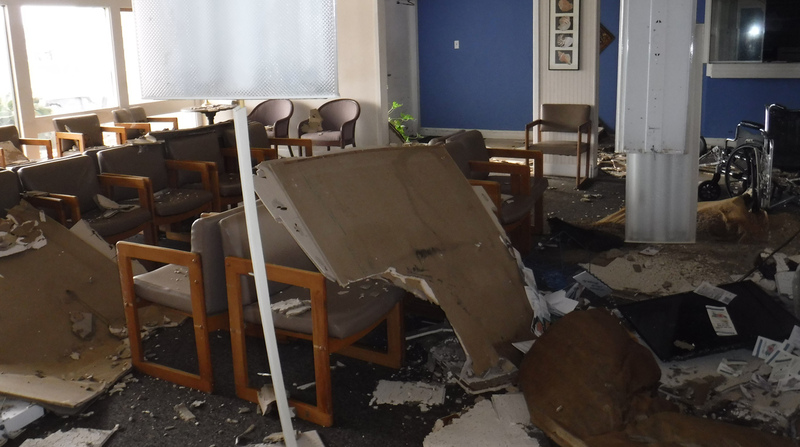 The Aransas Pass office of James Mobley, M.D., M.P.H., shows major damage after Hurricane Harvey collapsed its roof and scattered paperwork onto the streets outside. 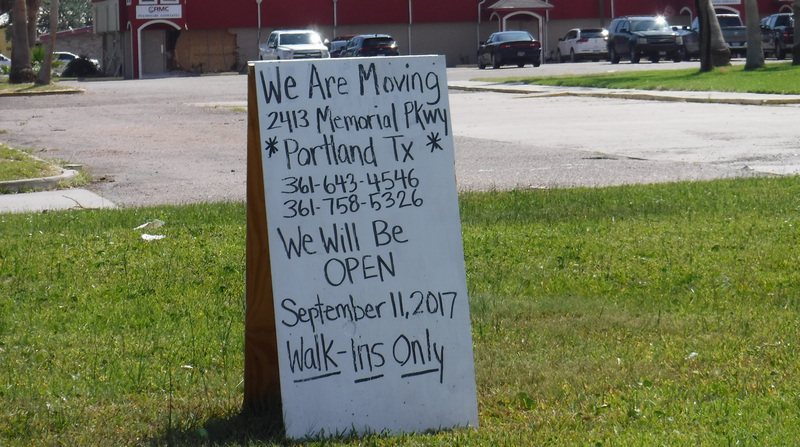 A sandwich board directs patients from the Aransas Pass office of James Mobley, M.D., M.P.H., to his other practice in Portland, which reopened on Sept. 11, 2017. James Mobley, M.D., M.P.H., (far left) poses with medical staff members outside his Portland practice, displaying the Certificate of Occupancy that permitted the facility to reopen. The AAFP recognizes that disasters and emergencies can happen at any time. That's why the Academy has updated its disaster relief/disaster preparedness resources to help you and your practice prepare for the worst. The resources on preparedness focus on three primary areas: personal, practice and community needs. 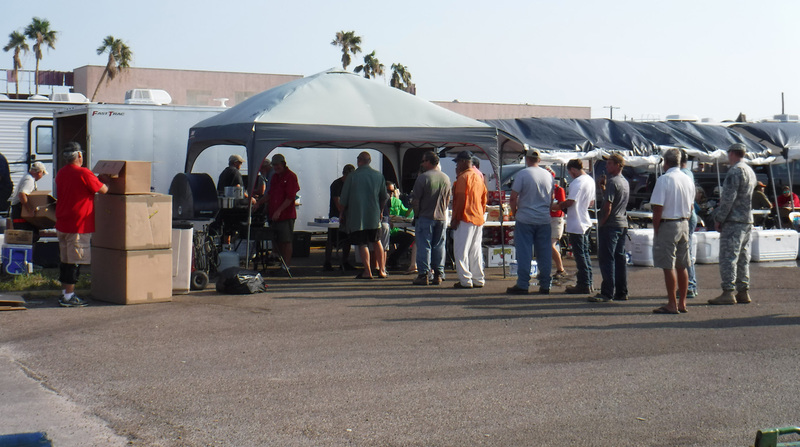 Next, a community preparedness guide(707 KB PDF) offers advice on how to work with the community during a disaster, including with disaster medical assistance teams. The AAFP has updated its disaster relief/disaster preparedness resources to help family physicians prepare for the worst. Family physician James (Jamey) Mobley, M.D., M.P.H., of Portland, Texas, helped create the disaster preparedness resources and told AAFP News he could have used resources like these when his practice and community were hit by Hurricane Harvey last summer. Family physician James (Jamey) Mobley, M.D., M.P.H., of Portland, Texas, who helped create the disaster preparedness resources, told AAFP News he could have used resources like these when his practice and community were hit by Hurricane Harvey last summer. 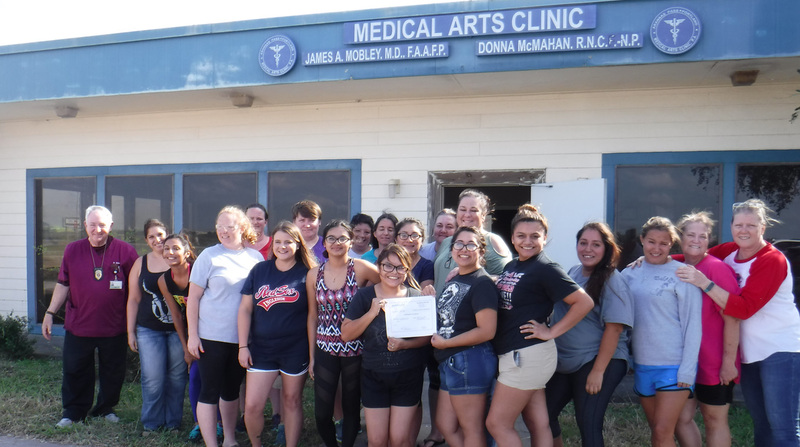 Mobley operated two family medicine offices in the area before the storm and continues to serve as part-time medical director for San Patricio County, which encompasses 14 cities and has a population of 68,000. Mobley remembers being on a call with local National Oceanic and Atmospheric Administration (NOAA) officials on Aug. 24, 2017, when they said Hurricane Harvey had changed from a Category 1 hurricane over the Gulf of Mexico to a high Category 3 or low Category 4 storm barreling toward land. The NOAA official said, "This is going to be a historic level of destruction; we are expecting 8 to 12 feet of water on the highway that connects Portland to Aransas Pass, and we're expecting landfall in less than 24 hours." "So suddenly, we went from a nice gentle rain to historic damage predicted; it changed very rapidly," Mobley said. As the county health official, Mobley asked all local health facilities to review their disaster preparedness plans during the week before the storm made landfall. He then helped set up an evacuation center at the county fairgrounds to handle evacuations from 4 p.m. on Aug. 24 until midnight and then continuing the next day until noon, when the winds became too high for buses to travel any longer. Hurricane Harvey made landfall on Aug. 25 as a Category 4 hurricane with peak winds of 132 mph. The storm created more than 50 inches of rain, caused 89 deaths and wrought $125 billion in damage. That first day, Mobley said, all power and communications were lost. "No cellphones, no landlines -- only the police radios were still working." Fortunately, as county medical director, he was able to secure a police radio. The sole hospital in San Patricio County -- in Aransas Pass -- was destroyed. The nursing home and Mobley's family medicine clinic next to the hospital were also both destroyed. "The hub of medical care for the county was basically destroyed in 24 hours," he said. A Texas Emergency Medical Task Force was dispatched to the area, which Mobley described as an 18-wheeler with medical supplies and staff on board. But the setup was missing an X-ray machine, he noted. "So, when we saw a lot of turned ankles, we popped them into ambulances to Corpus Christi about an hour away," he said. "The lesson learned here is go find an X-ray on wheels and get them to help you." Mobley also was lucky to have another clinic that was relatively undamaged located close to his house in nearby Portland. He and his staff were able to open the practice and begin seeing patients on Sept. 11, a little more than two weeks after the hurricane hit. Mobley passed on some of the lessons he learned from experiencing the devastation of a hurricane firsthand. Water is the No. 1 issue you must deal with in a natural disaster, Mobley said. "If you don't have water, you have dehydration, and you don't have proper bathing, so you have to deal with pests and diseases," he said. "You need at least one gallon of water per person per day for three days." Electricity is the second major issue to deal with. "You can't use your cellphones or credit cards without electricity," he said. "So, you need cash on hand to buy things such as gas, if any gas stations are open." On getting his Portland practice up and running, he said the first step was speaking with the insurance company about its practice interruption insurance. Have a Disaster Preparedness Story to Share? If you have a disaster/emergency preparedness story that affected your practice and that you'd be interested in sharing, email a description of your ordeal to Kait Perry, M.P.H., population health strategist in the Academy's Health of the Public and Science Division. "Also, you need to figure out how to pay your employees," Mobley said. "Our practice interruption insurance allowed us to continue to make payroll." Both of his clinics were insured, with the one in Aransas Pass totaled. "And that amount was enough to pay off our loan, which worked out very well," he said, although he added that he's still trying to figure out what to do with the facility, which is full of mold. Another issue Mobley dealt with was the hurricane hitting during a transition from paper records to electronic health records. "Think about HIPAA and hurricanes," he said. "We had peoples' private records blowing around out on the street. We lost about 50 percent of our paper records. The good news is once we were back up and running, we could access all of the files online." Lastly, Mobley's medical advice included urging practices to stock up on emergency medications. "These include Zithromax, two medications for blood pressure, two for diabetes …," he said. "I'm also working on a policy change -- what I'd really like to do at the beginning of hurricane season is give patients on chronic medications an extra 30-day supply. That includes first-responders, patients and families. And if they use it up by the end of the year, you give them another 30-day supply." In the end, said Mobley, you can prepare all you want, but each emergency is going to be different. "However, there are basic principles that are very important -- so whatever happens, you can respond the best you can to it," he said.